Start the journey with your arrival at the Guwahati station/airport, get greeted and straight away get transferred to the hotel. After fresh up we will visit the Umananda Temple which is a very famous Temple inviting hundreds of worshipers daily and then we will take a ride of the Brahmaputra Cruise Ride, which will take you to the heart of the Brahmaputra River. Overnight stay at Guwahati. 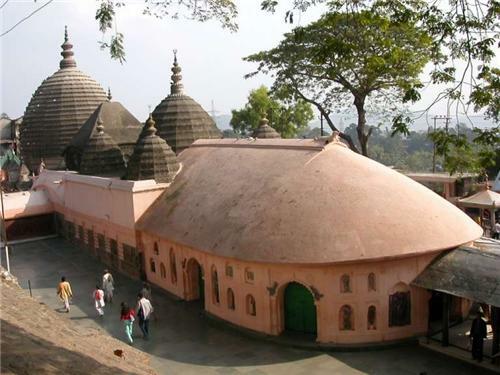 Attractions: - Umananda Temple, - Brahmaputra River. Early in the morning visit the Kamakhya Temple. After tha get back to the hotel and take the breakfast and then we will depart for Kaziranga which is a 4-5 hours journey from Guwahati. After arrival we will check in the hotel and retire for the night. We can also arrange bonfire in the night on demand. Charges Extra Overnight stay at Kaziranga. Early morning we will take you for an exciting elephant safari. Feel the gratifying pleasure in an early morning elephant safari across the Western range of the National Park at 5:30 A. M or 6:30 A. M. Meet the pride of India, the great Asian one-horned Rhinos with wild Buffalo, Tiger, Elephant, iety of Deer, Python and iety of migratory birds, water birds, predators, scavengers and game birds etc. 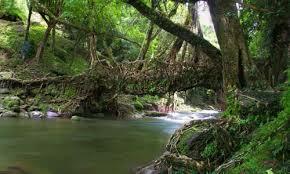 Then we will go for a local sightseeing including renowned lush green tea gardens of Assam. After lunch, we will go for jeep safari at the Western range of the national park for another dose of adventure into the jungle. Finally, drop you at your hotel. Overnight stay at Kaziranga. Attractions: - Kaziranga National Park, - One-Horned Rhino. Early morning after breakfast we head for Shillong, It takes around 7-8 hours to reach this gorgeous hill station. On the way, drop by the Borapani Lake in the state of Meghalaya, also known as the Umiam lake, it is beautifully surrounded by Sylvan hills. Overnight stay at Shillong. Attractions: Umiam Lake. 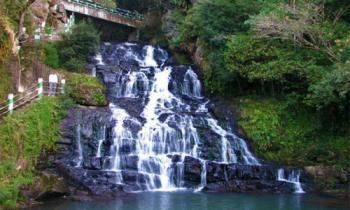 In the morning the first thing we will do is the breakfast and check out of the hotel and take a day trip of Shillong. 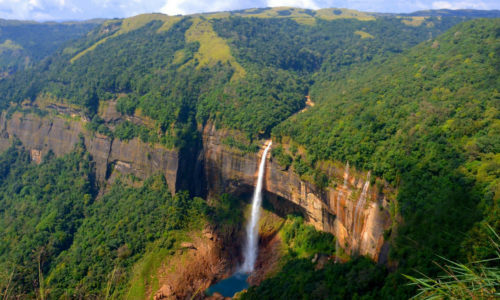 We will be visiting the Shillong peak, located in the upper Shillong from where one can see the beauty of Shillong city under the clouds giving a perfect picturesque view of the city. After a while we head to the Elephanta falls, the water of this three steps falls comes down in flows from different levels over the fern-covered rocks and falls into the canyon down below. After that our journey comes to one of most romantic place in Shilong, the Ward’s Lake, located in the heart of the city which was build by the British councils and is a prominent hang-out place in Meghalaya. At last is the Cathedral Catholic Church which attracts thousands of devotees. Overnight stay at Shillong. 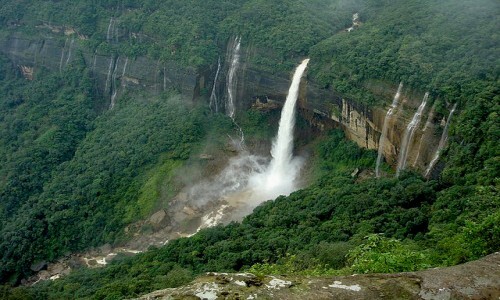 Attractions: - Shillong peak, - Elephanta falls, - Ward’s lake, - Cathedral Catholic Church. After breakfast, set off for Cherrapunji, well known for receiving one of the highest rainfall in the world. Cherrapunjee is locally known as Sohra and is situated at a distance of 56 kms from Shillong. 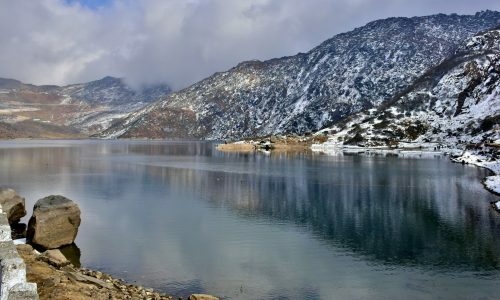 On the way is the Mawkdok Valley which is a very prominent sightseeing for tourists. Then on the way we visit the Nohsngithiang falls Seven sister falls which is known to be the symbol of the Unity of the Seven States of North East India. Later than we visit the Mawsmai cave, a major crowd puller that leaves tourists spellbound. After trekking in the majestic cave we move for Eco Park, which hosts several hybrid and indigenous orchids. It also offers a breathtaking view of distant Sylhet Plains of neighboring Bangladesh. Overnight stay at Cherrapunji. Attractions: - Mawkdok Valley, - Nohsngithiang Seven sisters, - Mawsmai Cave, - Eco Park.